The construction of this 1915 gambrel bank barn into the adjacent hill made it possible to load the upper half of the barn with loose hay to feed 40 dairy cows through a long winter. The hay storage levels that include the 3rd floor "hay mow" and the 4th level "high drive" are used for beautiful and memorable events hosting up to 162 guests. A grassy road behind the barn provides access to the high drive and a large open meadow for a beautiful ceremony site, lawn games, cocktail hour, and bonfire. splendid ceremonies have been held inside on the soaring high drive as well. The deck adjacent to the enchantingly weathered White Barn is another favorite location for lovely outdoor ceremonies. The property is yours to enjoy for the weekend and you are welcome to customize the spaces and to use your choice of caterer. Two clean white portable restrooms (and optional restroom trailer at additional charge). 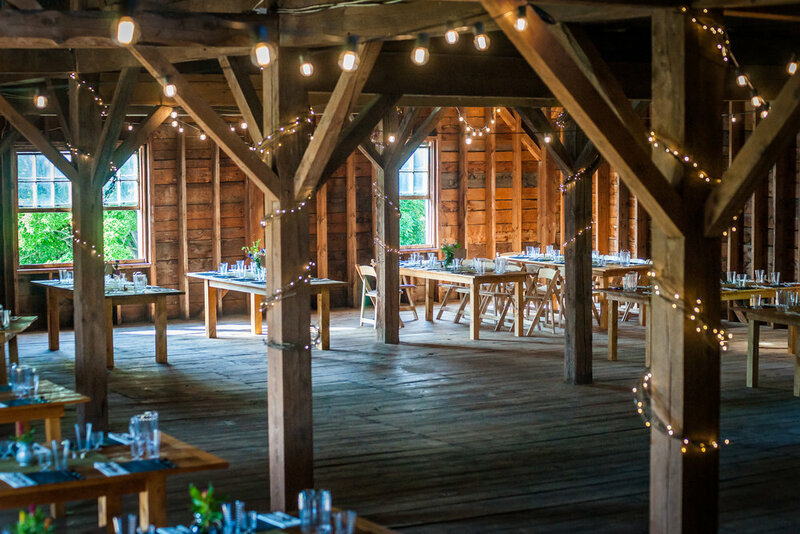 * Catered rehearsal dinners with up to 30 guests may be hosted in the White Barn for $1500 plus rental expenses. Additional fun items can be added such as popcorn machine, s'more package (handmade marshmallows), coffee service, flameless pillar candles (3 sizes and nice looking), outdoor sound system, flowers and decorations. Most couples pull together a team of friends and family to clean after the event, but we are happy to provide cleaning service for you. We are a registered Green Hotel and discourage non-reusable place settings. The 2019 weekend package price is $7,500 (plus 10% VT tax) from the 2nd weekend in June to before Labor Day weekend, and $9,500 (plus 10% VT tax) from Labor Day weekend through Columbus Day weekend. You are welcome to supply your own alcohol with a one day event insurance policy. We require certified insured bartenders and are happy to help you secure your bartending service. Depending on your bar tending needs additional bartenders and time may be required. It is highly recommend that a day of coordinator or wedding planner be involved. Please go to Wedding Planning and Day of Coordination on this website for information about the gal we work with and who is very familiar with what we do here as well the resources in this area. We are also happy to work with other wedding planners. To honor our permit and respect our neighbors, last call is at 10:00 pm, amplified music must end at 10:30 pm, and all guests that are not staying at the inn must depart by 11:00 pm. Your weekend can be reserved with a 50% non-refundable site fee deposit, 50% lodging deposit that is refundable (less service charge) up to 14 days prior to scheduled arrival, and 25% deposit for any outside rental items. Due our limited number of available weekends, a non-refundable site fee balance and 50% lodging deposit are due 180 days prior to the event. Although two-night booking of the seven-room bed and breakfast inn is required, it is common for us to make reservations and collect payment from the guests that you direct to us and we can help you with room assignments. We can also recommend a range of nearby lodging and transportation options for your guests. Please fill out the form below if you have any additional questions, or if you would like to schedule a tour. Please phone us at 802-672-5433 if you have not heard back within 24 hours. That means we did not receive your message.